U.S. Treasury Secretary Steve Mnuchin said some oil buyers could get waivers to continue buying Iranian supplies despite American sanctions on the Middle Eastern country. 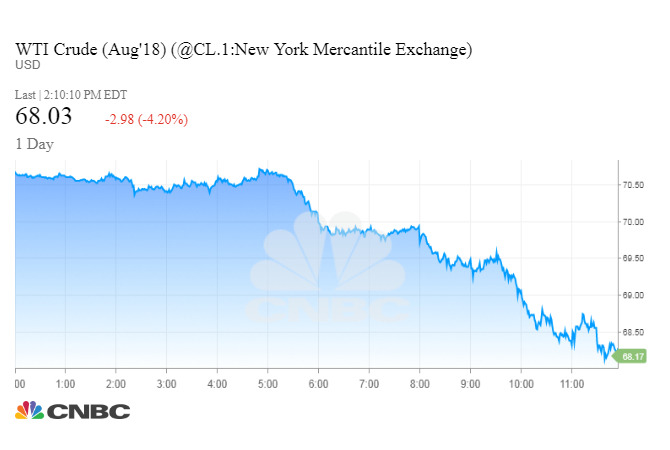 Concerns about the aggressive U.S. policy to remove Iranian barrels from the market have raised oil prices in recent weeks. Oil prices slipped earlier on Monday as concerns about supply disruptions eased and Libyan ports reopened. Treasury Secretary Steve Mnuchin speaks during a TV interview at the White House in Washington. Oil prices extended early losses on Monday, dropping about $3 a barrel, after Treasury Secretary Steve Mnuchin said some crude importers may receive waivers to continue buying supplies from Iran, despite U.S. sanctions on the Middle Eastern country. "We want people to reduce oil purchases to zero, but in certain cases if people can't do that overnight, we'll consider exceptions," Mnuchin told reporters on Friday while traveling to Mexico, Reuters reported. The comments were under embargo until Monday morning. Mnuchin told the reporters the Trump administration wants to avoid roiling global oil markets as it seeks to pressure Iran to make concessions on its nuclear program, ballistic missile tests and its role in regional conflicts. President Donald Trump withdrew the United States from the 2015 Iran nuclear deal and restored sanctions on Tehran in May. U.S. West Texas Intermediate crude oil prices ended Monday's session down $2.95, or 4.2 percent, at $68.06. WTI has fallen for two weeks in a row, dropping from a 3½-year high above $75 a barrel. Brent crude oil fell $3.49 per barrel, or 4.6 percent, to a three-month closing low of $71.84. The Trump administration sent oil prices soaring three weeks ago after a senior State Department official told reporters the agency had been pushing Europeans to cut their oil purchases from Iran to zero by Nov. 4. The tougher-than-expected deadline raised concerns about shortages of oil at a time when supply and demand are finely balanced. The State Department later signaled some leeway on the policy, and last week, Secretary of State Mike Pompeo said the administration will consider granting sanctions relief to a "handful of countries." The Trump administration now appears to be moving towards the approach followed by President Barack Obama. When the Obama administration expanded sanctions on Iran, it allowed importers to continue buying Iranian crude so long as the purchasing country's overall imports fell by 20 percent every 180 days. "The State Department has the ability to issue waivers around significant reductions in the oil markets, that's something that Treasury and State will be doing," Mnuchin said on Friday. The United States can use its influence over the global financial system to apply so-called secondary sanctions on foreign companies that continue to do business with Iran. However, administration's aggressive policy threatens to raise oil prices and leave Americans paying more at the pump ahead of midterm elections in November. The Trump administration is actively considering releasing oil from the nation's Strategic Petroleum Reserve to tame fuel prices, multiple news agencies reported on Friday. The Department of Energy did not return a CNBC request for comment on the reports. Oil prices slipped earlier on Monday as concerns about supply disruptions eased and Libyan ports reopened, while traders eyed potential supply increases by Russia and other oil producers. Russia and other oil producers may raise output by 1 million barrels per day (bpd) or more if shortages hit the market, Russian Energy Minister Alexander Novak said. "If we need more than 1 million bpd, I don't rule out that we can quickly discuss it and make a quick decision," Novak told reporters on Friday. OPEC, Russia and several other oil-producing nations agreed last month to raise output to tame rising crude prices. That partly unwound the producers' 18-month policy of limiting output following a prolonged price slump. A Norwegian union for workers on offshore oil and gas drilling rigs stepped up a six-day strike on Monday that has hit oil output. Production at Libya's giant Sharara oilfield was expected to fall by at least 160,000 barrels per day (bpd) after two staff were abducted in an attack by an unknown group, the National Oil Corporation said on Saturday.